The stress test went just fine, which is good because that means the baby is healthy, but the test also showed that the baby is still content just cooking in Mrs. Shife's baby. Her next appointment is Thursday so hopefully something happens between now and then. Someone suggested that Mrs. Shife start working on a really intense puzzle because babies love to interrupt stuff. I thought that was a good idea, but maybe a nice tattoo would be the motivation to get that baby to come out and say hello. My isn't that belly button in the pic appropriately placed? Funny! Glad things went well at the doc. Babies can be so independent about when they want to come out. When I was pregnant with Bear, my folks came for two weeks... no baby. She waited until the evening of the day they left. Little bugger! Thank GOD that is not tattooed on your wife's belly. Babies sure have a mind of their own. Had to smile at that tattoo. I am still thinking good thoughts for you all. I can't wait to hear the news! 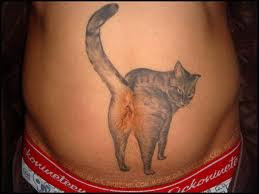 Eeew that tattoo is gross!!! Are you sure Mrs. Shife didn't just swallow a watermelon seed?